Thank you for sending the recent “History’s Newsstand” [newsletter]. Good stuff. I wanted to share with you, assuming that you are also a history “nut”, a news item that I came across in a recent purchase. 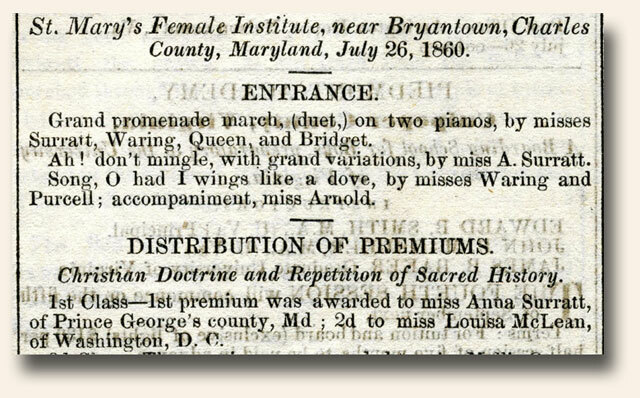 From the Daily National Intelligencer, Washington, August 9, 1860 (see attached) a mention of a “Miss. A. Surratt” of Prince George’s County (Surrattsville now Clinton, MD.) Although I may never know for sure, the name, place and date seem to match up correctly with Elizabeth Susanna “Anna” Surratt (1843-1904), daughter of Lincoln assassination co conspirator Mary Surratt. I became interested in the tragic life of little Anna through my research on the Chapman sisters of Ford’s theater fame. Love these old newspapers. Historical goldmines each and every one. Once again: History is never more fascinating than when it’s read from the day it was first reported.